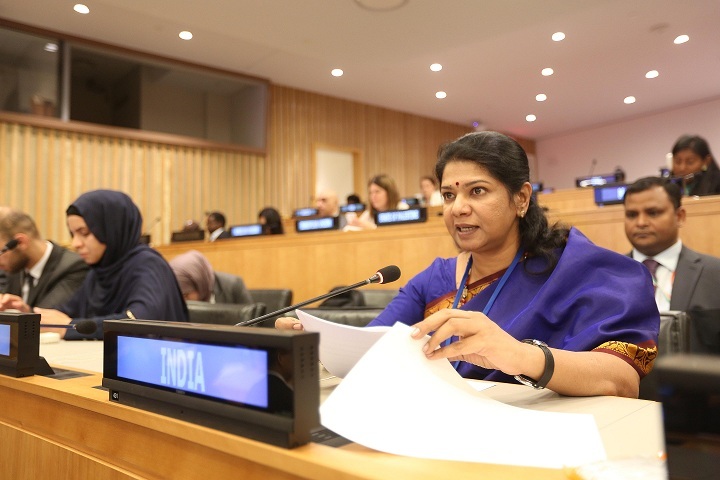 The DMK MP Kanimozhi Karunanidhi is part of the delegation of Indian Members of Parliament, who are currently participating in various sessions of the six committees of the UN General Assembly. Speaking at a session on Sustainable Development, Kanimozhi Karunanidhi said, "Thank you Mr. President, I am honoured to share India's perspectives on the important issue of sustainable development. India associates itself with the statement delivered by Egypt on behalf of the Group of 77. Mr. President, India had actively engaged with the finalisation of the 2030 Agenda for Sustainable Development. Our ongoing national efforts to pursue an inclusive and sustainable development are in close sync with the global agenda. Sustainable development has to address the hopes and aspirations of the millions below poverty line and has to keep the poor and the marginalized at its centre. We are conscious that India's actions and experience, with one-sixth of the world's population governed in a democratic setup and being consistently among the fastest growing large economies, have global implications and therefore attract interest. India is also pursuing development partnerships with fellow developing countries. Last year, here at the UN, India presented its Voluntary National Review on its implementation of the SDGs. Mr. President, India is pushing ahead on each of the SDGs with strong political commitment and execution by all stakeholders in our federal setup. NITI Aayog, the nodal agency in India for overseeing the implementation of the 2030 Agenda will measure the annual improvements on the parameters of health, education and water management. It will monitor local level development and provide incentives to the provinces appropriately. Another index has been prepared to rank provinces based on their performance on the SDGs. It ranks them on 82 schemes o traditional donors to step up their voluntary contributions for timely operationalisation of the ‘Reinvigorated Resident Coordinator System’. We also welcome SG’s efforts to reform UN DESA to be able to play a meaningful role along with the rest of the UN system, towards achievement of 2030 Agenda. The UN Sustainable Development Framework (UNSDF) for 2018-2022 signed with India last week focuses on leaving no one behind, echoing the Government of India’s message Sabka-Saath Sabka-Vikas, which is development for all. Sustainable development has to address Climate change through appropriate mitigation and adaptation measures. India welcomes the initiative of the Secretary General to renew the focus on Climate Action. India is undertaking a transformation of its energy-mix towards renewable energy. By 2022, India plans to produce 175 GW of renewable energy that will include 100 GW of solar power. India's leadership has been recognized by the UNEP which has conferred the Champion of the Earth award to Prime Minister Modi earlier this month. Cochin airport in southern India that runs on solar power also received this award. India has partnered with France and other countries to launch the International Solar Alliance (ISA) as a tangible contribution to the collective global efforts on climate action. 70 countries have already joined this Alliance, which has now been registered at the UN as a multilateral treaty. 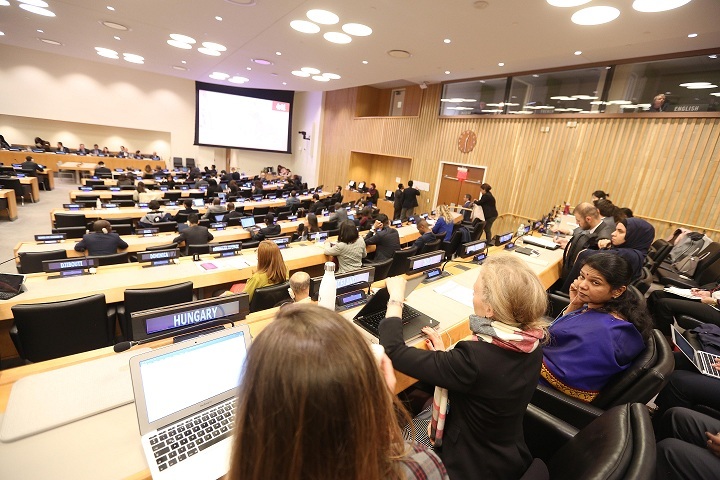 Secretary General attended the first General Assembly of the ISA earlier t Mr. President, We value the role of global partnerships for achievement of SDGs and look forward to the Conference on South-South Cooperation in Buenos Aires next March. The India-UN Development Partnership Fund has further stepped up our engagement for development partnerships. with LDCs and SIDS. India continued its contribution to the UN Tax Trust Fund for the second successive year. We have also contributed to the trust funds for Technology Bank for LDCs and for organisation of the mid-term review of the Vienna Programme of Action for LLDCs. Mr. President, India will continue its strong efforts towards sustainable development of our people and also partner fellow developing countries in a spirit of south-south cooperation to achieve the SDGs. Thank You”.